Earlier this year I taught a series of STEAM (science, technology, engineering, arts, and math) classes for a group of homeschool families with kids in grades kindergarten through 8th grade. The classes were a blast, and I enjoyed the challenge of finding subject matter and activities that would appeal to kids across such a wide age range. One of the topics we covered was chromatography. 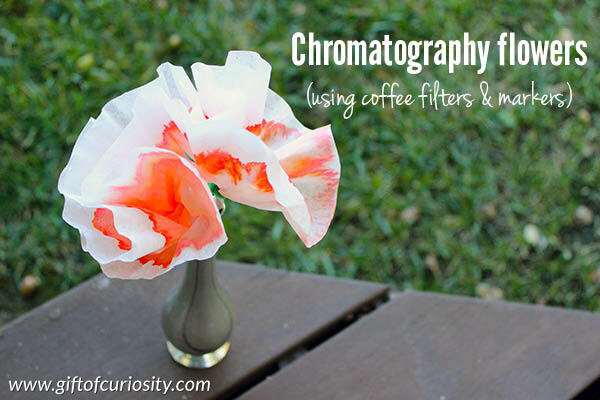 Chromatography is the separation of a mixture (e.g., marker ink) by passing it in a solution (e.g., water) through a medium (e.g., coffee filter) in which the components of the mixture (e.g., the various colors that make up any given marker color) move at different rates. As one of our activities to learn about chromatography, we made chromatography flowers. 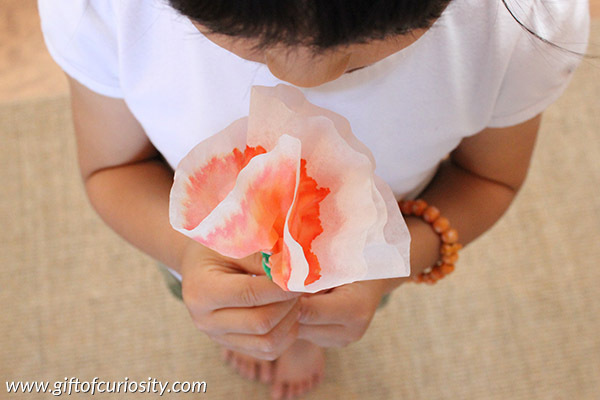 Despite the fancy science word (e.g., chromatography), this is actually a pretty simple craft to do, and it was enjoyed by kids from a wide age range. 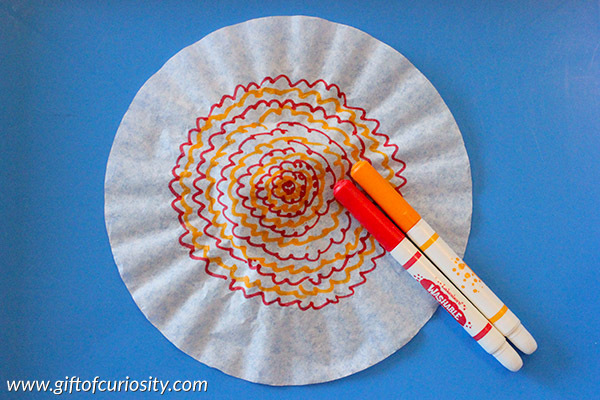 Start by using the markers to color on the coffee filter. You can experiment with different colors, different designs, drawing close to the center of the filter, and drawing close to the edge of the coffee filter. 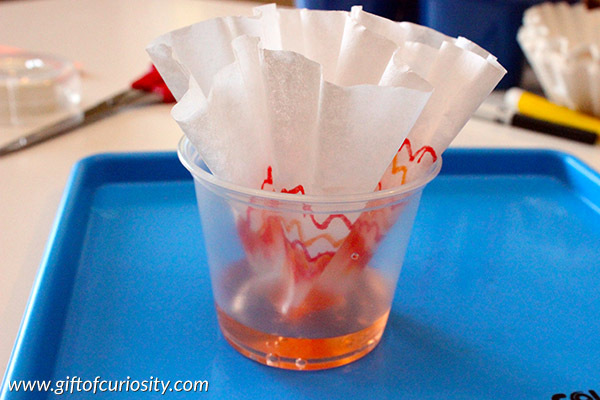 Next, fold your coffee filter in half a few times so it becomes wedge-shaped. This will create a point where the center of the coffee filter is. Place the coffee filter into a container with a small amount of water at the bottom. Note: You do not need to fill the cup all the way with water. This activity works better when only the very bottom of the coffee filter is touching the water. Wait 5 to 10 minutes for the water to seep up through the coffee filter, carrying the marker ink with it and spreading it throughout the coffee filter. Then unfold your coffee filter and lay flat to dry. I like to place a paper towel on a tray and dry the coffee filter on top. When the coffee filter is dry, fold it again as you did to put it int the water. Pinch the middle of the filter and wrap a green pipe cleaner around it to make a stem. Fluff out the “petals” as you like. 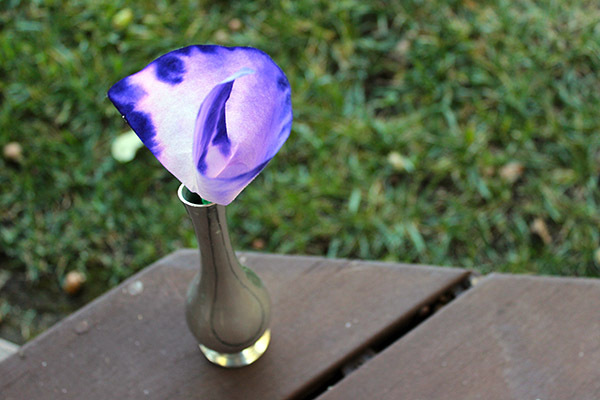 The final result may not smell as wonderful as a real flower. But it is sure to be beautiful nonetheless. 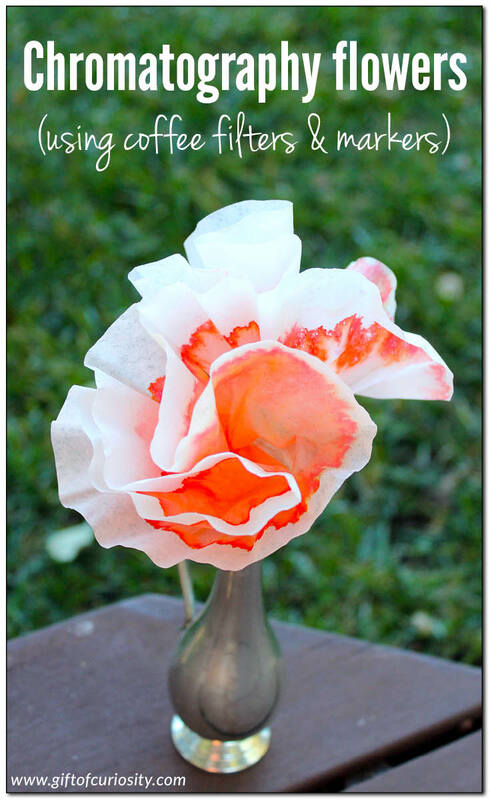 You can use this coffee filter technique to make so many beautiful flowers! Looking for more hands-on activities that incorporate Science, Technology, Engineering, Art, and Math (STEAM)? Then you’ll love STEAM Kids! 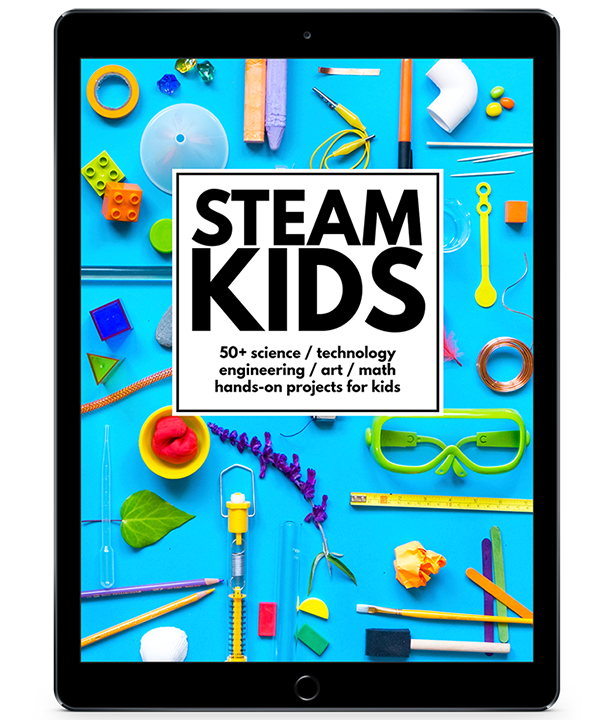 This book features 52 hands-on activities are helpfully identified by category (science / technology / engineering / art / math) so you know exactly what skills your kids are developing. Grab a copy of the e-book delivered as a PDF download (or this e-book for EU residents) and in print at Amazon. For more fun art projects, see my Arts and Crafts for Kids page and my Arts and Crafts Pinterest board. Follow Katie @ Gift of Curiosity’s board Arts & Crafts on Pinterest.